In Haiti, VIP means Rantre Gratis. There are many Haitian VIPs who refuse to PURCHASE a TICKET to attend a Haitian event. They all want to get in for FREE! There are many people, including Haitian artist (actors, musicians, etc), Haitian media personnel (radio and television), and lots of self-proclaimed Haitian VIPs who refuse to pay. 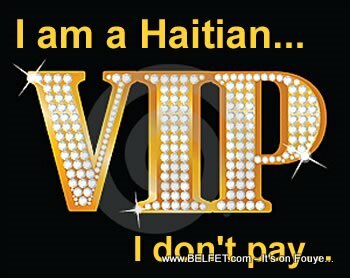 In all Haitian Movie premieres, Haitian Bals, Festivals, and other events, these Haitian VIPs want to get in for FREE. "Don't you know who I am?" they say, "I don't pay for these things!" In the mean time. The will pay hundreds for a bottle.